If you are tired of store bought apple strudel that’s more pastry than apple filling try this Easy Apple Strudel recipe that is packed with fresh apples and has no preservatives or artificial ingredients. Some supermarket bakeries enhance the color of their strudels, turnovers, cakes, and pies by adding artificial colors. 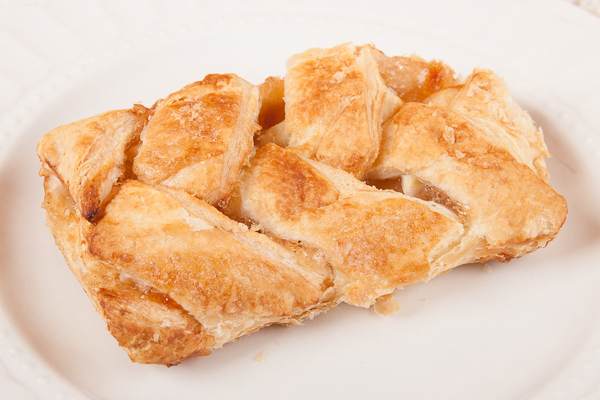 The warehouse club brand apple strudel pictured below is bargain priced, but you get 20 percent filing (about 30 g) and 80 percent pastry (120 g). That’s 4 times more pastry than filling. You’re paying for refined wheat flour and sugar and very little apple filling. It should be called baked puff pastry with a hint of apple. The filling from one of these strudels easily fit in a tablespoon. That’s about 1/2 cup (120 ml) of filling for 8 strudels. Talk about cutting corners! This apple strudel recipe uses thin, crisp, fillo dough instead of puff pastry. Fillo dough is available in the frozen foods area of most supermarkets along with other frozen breads and doughs. Why use two types of apples? Since this strudel bakes in a fraction of the time needed for apple pie, quick cooking Golden Delicious apples provide sweetness and Fuji apples (you can substitute McIntosh) provides crunchiness. This strudel recipe has apples with a firmer texture than prepared strudels made from fresh or dried apples. You can make this recipe using butter, margarine, or vegetable cooking spray. If you are concerned about calories and saturated fat, using cooking spray reduces saturated fat by over 80 percent. 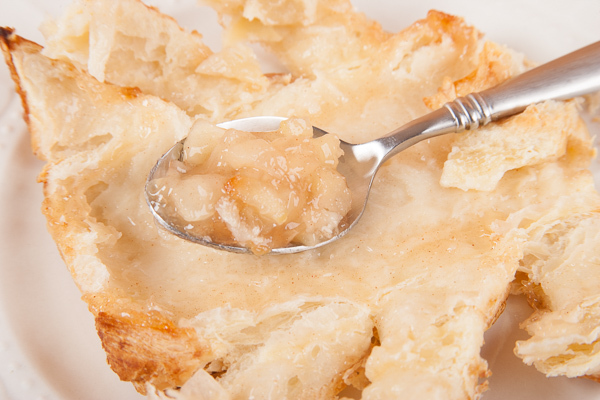 The breadcrumbs absorb moisture from the apples as they bake producing a crisp pastry. You can substitute fried, unseasoned breadcrumbs for fresh breadcrumbs. To prevent discoloration while preparing apples, slice and place in a large bowl of water with several tablespoons of lemon juice or a 1/2 to 1 teaspoon of citric acid. Drain and pat dry with paper towels before adding other ingredients. Fillo sheets can be coated with cooking spray instead of melted butter or margarine. Cooking spray reduces saturated fat. Place an oven rack in the middle or lower position of your oven and preheat to 475°F (245°C). Peel, core, and slice apples about 1/8th inch (3 mm) thick. Toss with bread crumbs, and combine with 1/4 cup (50 g) granulated sugar and cinnamon. Place a large sheet of parchment or waxed paper on your work surface. Carefully place one sheet of fillo on the paper, brush with melted butter, and sprinkle with sugar. Repeat 4 times. Place one-third of the apple filling in a 3-inch (7.5 cm) wide strip about 3-inces from a long edge of the dough. Fold the the two short edges over the apples and the long edge nearest the apples. Loosely roll up the strudel and place on a baking sheet. Brush with melted butter and sprinkle with sugar. Repeat for the two remaining strudels. Use a sharp knife to cut 3 or 4 1-inch (2.5 cm) vent holes on top of each strudel to allow steam to escape. Bake about 15 minutes or until deep golden brown. Do not over-baked or the the sugar sprinkled on top will begin to caramelize and burn. Cool on the baking sheet 30 to 40 minutes or until warm. Use two spatulas to transfer the strudels to a serving plate or cutting board. Use a serrated knife to slice.